WASHINGTON (PCPI) White House Press Secretary Robert Gibbs today announced that the United States will boycott the 2016 Olympic Games, citing the unprecedented racism displayed by the International Olympic Committee in rejecting Chicago’s bid to host the games on the first ballot. Even more surprising was the IOC’s obstinacy in the face of not only Oprah Winfrey’s presence, but in snubbing the Greatest President in All American History, Barrack Hussein Obama. Both were stunned by the IOC’s adamant refusal to even consider the Chicago venue for the games. Upon his return to Washington President Obama was quick to sign an executive order calling for a boycott of the games. 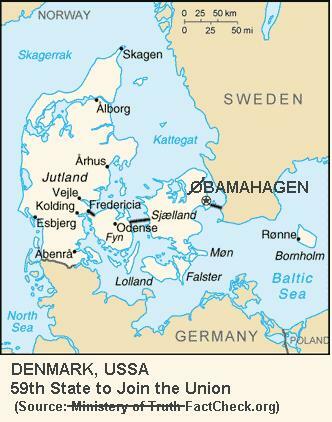 Attorney General Eric Holder has opened an investigation of the hate crime committed in Copenhagen (which is notorious for the number of blonde-haired, blue-eyed residents) and the White House has called for Congressional hearings to determine if any criminal charges can be brought against foreign nationals. The First Lady has been heroic in her stoicism regarding the entire incident. “It was exceptionally difficult to bear this new humiliation. I had hoped that for the first time in my life, I could be proud of my planet. But the hatred and racism that have kept me down throughout my life are still at work,” she said in a prepared statement. Maybe if Oprah had hosted a pancake breakfast for the IOC, things would have turned out different. 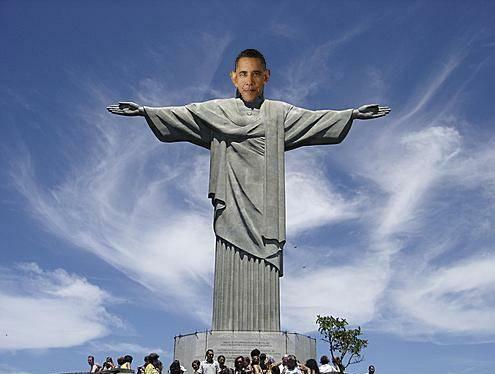 There is a problem: Brazil's president Lula is even more progressive than Obama. In addition, Obama has just received a consolation Nobel Prize. But if the Party requires me to act and burn something, I will respond by burning more CDs of Brazilian musicians Antonio Carlos Jobim and Astrud Gilberto. 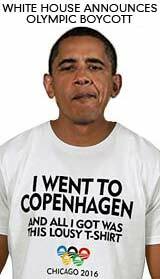 O may send a long-range missile to Copenhagen just like Clinton sent one to Afghanistan. However, one wonders if that would be justified - think what could happen to the innocent Muslim community of Denmark. Can the world afford to make them collateral damage? This is most distressing news, as I am half-Brazilian. I suppose I will have to sacrifice that part of my Cultural Identity(TM) for the Kollektiv(TM)... at least until the Rio Olympics are over... or until the Current Truth(TM) Changes(TM). Thank you for your input. Perhaps you could translate some of the Brazilian songs for us from the Portuguese. For instance, the phrase "Agua de beber camara" in the above song. I think "Agua de beber" means "water to drink." What does "camara" mean? It always sounded funny to me because in Russian it means "of the mosquito." Speaking of languages, I think that "Lenya Komsomelettes" in the Mother Tongue would sound more properly as "Lena Komsomolka" or "Komsomolka Lena." "Lenya" is a male name, short form of Leonid (as in Leonid Brezhnev). Unless you had something else in mind which I missed, you can easily change your user name in your profile. Yes, most equal Comrade leader. I like this one too- Paula sends an Obama-esque tingle up my leg.. Like what Chris Mathews experiences from exposure to the Chosen One. "Camará doesn't have a real meaning -- the real word is "Camarada: and it means "my friend". He used "Camará" to play with words and make it sound better/poetry... Others may argue that Camará is used in verses of the capoeira dance (by its fighters/dancers)... but I don't buy that ;)"
Oh, so it means "Comrade"? Even better! "It's water to drink, comrade!" Sounds like a Gulag song. No wonder it sends tingles up the collective leg! Lenya Zubritsky is the name of a female character in Neil Simon's play Fools, which is supposedly set in Ukraine. I played Lenya in my high school's production. "Komsomelettes" is my play on the name of the K-278 Komsomolets submarine; I just wanted to give it an absurdist flair. Maybe I just have an odd sense of humor...? I only know a few words and phrases in Portuguese, but I see Komrade Turboski has come to your aid. No sweat, Komradka Lenya. I actually like the spelling of Komsomelettes but in your case it throws me off because "Komsomolets" is a male member of Komsomol, while a female member is "Komsomolka." Until now, I too always thought it was a girl's name. In fact, babynology.com says it is. But the same site also lists it as a boy's name. I learn the darndest things from Red Square. Could there be a growing trend in the Motherland, of giving traditionally masculine names to girls? That's become very common in this country, e.g., I know children of both sexes named Taylor and Casey. I can only imagine the problems it causes. I made sure to give my sons decidedly masculine names, and my daughter a very feminine name. I also learned the darndest things from babynology.com. I didn't know that the Russian male name Lenya comes from Lion that means "light." The fact is, there is no such Russian name as Lion and it can't mean "light" because the same site says the female name Lenya comes from Elena that also means "light." Lion means "lion" as in "big cat." In Russian, it's either Lev or Leonid. Trotsky's first name may be spelled "Leon" in the US, but in Russia his name was Lev Trotsky (real name Lev Bronshtein). English equivalents: Ellen, Helen, Helena. Derived from the Greek name Heléne, Latinized into Helena or Helene. Taken from hele meaning "splendor, vigor of the sun." That could mean "light" too, I guess. But it's such a decidedly feminine name that no parents in their sane mind will call a boy that. Sorry, babynology, but the Russian version of the name is actually Yelena (as in Yelling Yelena), with a folksy version Alyona. The short version is Lyena (also spelled Lena for simplicity). "LY" in this case stands for the soft L sound as opposed to the hard L (in Slavic languages, most consonants have the soft and the hard version, which changes the meaning of the word). In Ukrainian, the name is Olena with a hard L.
So I guess "Lenya" could be a misspelled, dyslexic version of "Lyena." As for the male version, the closest is Lyonya (could be also spelled Lenya for simplicity). In some cases, the Russian e and o are interchangeable (as in Potemkin, pronounced as Potyomkin). Lenya is short for Leonid (as in Leonid Brezhnev). Growing up in the USSR, when we spoke disparagingly of Brezhnev, we called him Lenya (Lyonya). As for Neil Simon, he was probably getting his supposedly Russian/Ukrainian names from babynology.com as well, because the list of characters in his play Fools I got from Wikipedia shows a complete lack of understanding of the names and culture. Almost every name on this list says "the author is a phony ignoramus." And the village of Kulyenchikov, Ukraine is also an impossible name. I hate to disappoint you, but in this instance Simon just comes off like one of the many literary hacks in this country who have no idea what they are writing about. In 1981 when Fools was written, there had already been enough Soviet immigrants in the US to consult with. I guess he was just too lazy or too confident in his own genius. To compare, imagine your reaction to finding out that somewhere overseas there is a popular spaghetti western set in a small village of Newyorkervilleson, New Jersey, in which a cowboy named Jeeves O'Katznelson, aided by a local nobleman Dzhordzh MacWashingtonpost defeats an Indian bandit Wild Jalapeño Poppersteak and wins over a tender girl named Piñata Balls. What would you think of the people who wrote the play? GENIUS! Can The Peoples Theater™ play a Bollywood film tonight? Huh, Glorious Leader? Or if it's a Spaghetti Western, how about "A Fist Full of Rubles" or "For A Few Rubles More"... or that classic of all classic Spaghetti Westerns: "The O.K., The Somewhat O.K., and The Aesthetically Challenged"
These are just the few I can remember without leaving the bunker. I'm still crying with laughter over "Piñata Balls"--hanging them from a tree and whacking them with a shovel. Fools allegedly was written as the result of an agreement Simon made with his wife during their divorce proceedings. [sup] [/sup] She was promised the profits of his next play, so he attempted to write something that never would last on Broadway. Given it closed after forty performances, he succeeded. If that's true, then it makes me wonder if he screwed up the names intentionally--but I should think that's one of those things where you have to know the rules before you can break them. Nonetheless, should I ever write something set in Czarist Russia, I see you'll have to be the go-to guy for name checks and endearments, etc. I'd be too afraid not to now. I'm glad you liked Piñata Balls. I first thought it should be the name of a Mexican bandido, but then thought it would be funnier if it's the name of a ball-busting girl. I don't think Neil Simon screwed anything intentionally, otherwise it would make at least some sense in any of the languages. All to often I've seen the same inane pretenses to portray anything Eastern European in Hollywood movies and TV series. These people unthinkingly follow some stupid ethnic stereotypes created who knows when and by whom. They are also usually the people who raise stink about ethnic stereotypes. This mass delusion is occasionally broken by some real original art where Russians, Ukrainians, Poles, etc. are portrayed as live, real human beings. But that is very rare. What we do on the Cube is different, of course. We bring the stereotypes to absurd proportions and the resulting humor brings an intellectual catharsis. Plus an occasional hangover and a whack on the head with a shovel. I have on good authority that Neil Simon and Arthur Miller were ButtBombers. That's right, the whole marital escapades were a fraud, even the one to the intellectually abused pawn Marilyn Monroe, of which I have further information that I will not divulge in this courtroom. So there you have it, Death of Salesman and Fools, a real prog buttbomber paradise. Yes, that would be an absolutely frightening play. Or a really funny one. I did not mean to imply that Neil Simon was an authority on Russian or Ukranian names; I just wanted to explain where I got the idea from. The world of theater is the last place I would ever look for historical accuracy. This is one of the many reasons I've been avoiding even auditioning for college productions. However, I feel compelled to change my name; as it sounds rather ridiculous now... Wait! I know! In high school I did another play in which I was the exiled Grand Duchess Olga Katrina! Yes, it's bourgeois, and it's an imaginative spin on history, but that works out because progs do that in history textbooks and plays all the time. Well, apologies for getting this thread off-topic. Regarding the Olympics, I've found another reason to like the song Rio by Duran Duran. Komradka... Well, who am I now?? After sleeping on it (these are the things that keep me up all night), I now find myself asking what sort of crappy divorce lawyer would get the ex-Mrs. Simon the profits from only one play--and that one immediately following the divorce? That's almost a dare to write a flop. If I were in a breakup with Mr. Simon, I would demand a share from all future plays, or at least the plays he wrote while I was married to him. Perhaps, after the play flopped and was panned by the critics and he was burned in effigy by the Soviet Immigrant Anti-Defamation League, he sought to cover his backside and rationalize his self-made disaster with this story of the divorce agreement. I have personally known people who will do this just to avoid saying, "I screwed up." And they don't care how ridiculous and full of holes their cover story is, or even if it leads to others thinking they're full of it--to such people, they'd rather be known as full of it than take any responsibility for their mistakes. It's like liberals who, when they come under too much fire for a remark they made, try to cover their backsides by insisting it was a joke. That's exactly what Sheryl Crow tried to do after her remarks about using one square of toilet paper. But that also raises a few credibility issues--how do the gullible masses know she isn't joking about other things she says in regards to saving the planet? If it's true it really was a joke, then it doesn't say much about how seriously committed she is to her pet cause. But that's not important. What's important is never having to say, "I was wrong." Lenya: Whether you change your name or not, I'm glad we haven't scared you away. When I first came here, I picked a name that was utterly meaningless, because at the time I had no idea I was going to get into the Cube as deeply as I have since then. Yeah, I didn't know how involved I was going to get with the Cube, either. Ugh. More reasons to be disillusioned with Simon and the play, but it was still a fun production in high school. Making the audience laugh was what mattered most to me. I totally agree that authors and artists should strive for accuracy in their work (it would probably make their work more entertaining anyway and I'm frankly disappointed that Simon didn't make the effort), but "Fools" brings back a lot of fun memories for me. As does "You Can't Take it With You" by Hart and Kaufman, in which I played Olga Katrina. In college, I'm not even a theater major. I'm an international affairs major. College theater generally scares/annoys me. I denounce Neil Simon for his Cultural Insensitivity!! And for causing my Identity Crisis!! The Executive Order apparently was a ruse... The Olympiks will indeed occur in Chicago.... Rio De Chicago! That's exactly what Sheryl Crow tried to do after her remarks about using one square of toilet paper. Well now, if the honorable Ms Crow would have paid attention in history class, she'd have a great way out of this. The first recorded use of paper as bum fodder was by a Chinese Emperor in the Middle Ages. The paper in question came in 2 foot by 3 foot sheets. These must be the squares to which she was referring. That's exactly what Sheryl Crow tried to do after her remarks about using one square of toilet paper.I have been thinking about this too. My cats Calvin and Hobbes don't need any toilet paper, but then cats don't. If you inspect their sand box, you find hard little turds. Which makes me think that Sheryl Crow must eat Purina Cat Chow. Oh, and Neil Simon is an excellent playwright--for dinner theater in the 70s where all the customers wear polyester ties with huge baseball-sized knots, two-toned leather shoes, and huge polyester coats. And they get their food from a buffet, and the people who bring their drinks later on are in the cast of the play. Been there, done that, in Tucson in 1974. As I recall the lead character was a fishmonger who kept smelling his hands to see if he stank of fish. It might not have been Neil Simon but then, to steal from Dan Rather, it's essentially true anyway. And I think it was Neil Simon. Pinkie, you're right about the fool woman getting the proceeds of his next play. Only if she had enough belief that his ego would triumph his revenge would that have been smart. But then we have heard about actors who negotiate for a percentage of the profit of movies. Fools. A jerk named Frank once offered to buy my business for a percentage of the "profits" of his title-company "empire"--the sound you hear is my coughing in the west--and I turned him down out of hand, of course. I'd have been making his car payments. Personally I don't trust anyone enough to believe in their bookkeeping. If I do, you'll find me watching Peter Popoff. But if Simon's ex-wife went for that, and her lawyer agreed, then they both ought to go have a honorable mention in the Darwin Awards. Hmmmm....would it be OK if we watched the games on a station from the Great and Glorious Socialist Land of Kanada? It would be okay if a station owned by Ted Turner carried them. Oh hell. If NBC, CBS, or ABC carried them. Right from the Kremlins in New York City. It has been a while since I wrote anything, but I couldn't be silent. PS: Definitely "Água de beber, camará" is "water for drinking, comrade!" Never thought of it as a Gulag song before! Genius!!! PS2: Komradka Katrina, If you are reading this post, bem-vinda ao Cubo! 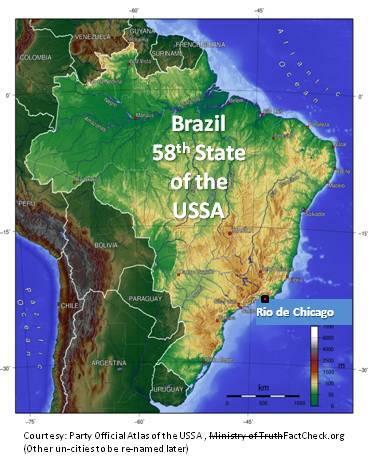 I'm only partly Brazilian, and I live in the glorious USSA. On the other side of my family, I'm English, Scottish, and German...but that, of course, is not REAL Diversity(TM). Now there's diversity and diversity. Diversity of bloodlines--that's just fine. But Lenin help you if there's diversity of opinion. Unless it's the best way to insert your meat hooks into someone else's property, liberty, or life. Then diversity is just fine. But your opinions must be in lockstep with those of other Made Progressives. Is there anyway the collective can make Bossa Nova and Brazilian Jazz a fundamental right under the "Constitution"? Say they're being repressed by the music of Dead White European Males, such as Bach and Mozart. Like sports in college, where women's sports must be funded as much as men's even though women may have no interest in a particular sport. Just as les Froggies demand that 40% of music on French radio stations be froggie music. We can make it so that alternative music is defined any way we want it and demand that a certain percentage of air time be devoted to it.